Kit out a future Spartan, with a cute tutu. Creative Knitwear Baseball long sleeve tee features contrasting sleeves and collar. Creative Knitwear toddler baseball long sleeve tee features contrasting sleeves and the collar with YC logo on the front chest. Our Delta long sleeve shirt has the college shield and York over College on the chest. The shirt is oatmeal and moss green. 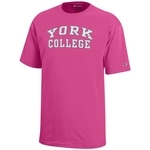 This Delta long sleeve tee comes equipped with a hood, and has a York College shield design on the chest. 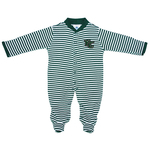 Garb infant onesie with "Here we go Spartans, Here we go!" across the body. Garb infant onesie with "LOVE" across the body. Garb Polka dot infant onesie with "YC" across the body. Garb infant onesie with York 87 across the body.